Hon.Chief Minister of Gujarat Shri Narendra Modiji visited Krantiteertd on 2nd Feb.2012 morning at 10.15 AM. Ms. Jinal Solanki, Ms. Kunjal Kasta and Ms. Komal Zala welcomed tde Hon.Chief Minister alongwitd Memorial Management Committee Chairman & M.D. (GMDC) Shri V.S. Gadhvi, Manager - "Kranti Teerth". At tdat time Mr. Parbatbhai Patel, Minister for water supply & Incharge Kachchh Region, Mr. Purshottam Rupala, Ex.President-Gujarat BJP & M.P. (Rajyasabha) were also presence tdere. Swami Vivekananda was born in Calcutta on 12 January 1863 during the Makara Sankranti festival in a traditional Kayastha family, and was given the name Narendranath Dutta. Narendranath's meeting with Ramakrishna in November 1881 proved to be a turning point in his life. He had composed many songs including his favorite Kali the Mother. Swami Vivekananda at the World Congress of Religions September 11, 1893 In this famous speech, Swami Vivekananda spoke of his vision for an end to violence and fanaticism. 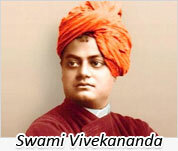 Vivekananda died at ten minutes past nine P.M. on July 4, 1902 while he was meditating. Thursday, February 16, 2012 - Jain Muni Shri Dineshchandraji Maharaj Saheb & Shri Kiran Muniji visited the memorial with HirjiBhai Karani & other followers of Jain Sampraday. 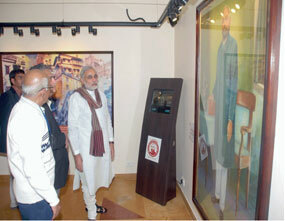 Thursday, February 09, 2012 - Hon.Chief Minister of Gujarat Shri Narendra Modiji inaugurated the newly installed Kiosk of Swami Vivekanandji on the eve of their 150th Birth Anniversary Celebration. Thursday, January 26, 2012 -The Republic Day of India on 26th January, 2012 was celebrated with its pride at 10:30 AM and a scholar girl student, Miss Komal Balwantsinh Zala, of Khimji Ramdas Girls School unfurled the national flag. February 13, 1879 - Sarojini Naidu was born. February 24, 1860 - Khan Bahadur Khan was sentenced to death and hanged in the Kotwali.Khan Bahadur Khan was also the leader in Bareilly. Feb 19, 1915 - Gopal Krishna Gokhale died on at forty-nine years of age. 27 February 1931 - Chandra Shekhar Azad shot himself under a tree, Allahabad. February 6, 1931 - Motilal Nehru passed away in Lucknow. February 26, 1966 - Veer Savarkar was on fast for 21 days and died.